On this date in 1889, the only guillotine execution in North America took place on the tiny French remnant colony of Saint Pierre, just off Newfoundland. August(e) Neel had capped a Dec. 30, 1888 drinking binge with fellow fisherman Louis Ollivier by breaking into a boat captain’s cabin they expected to find empty. Instead, they found the armed captain ready to defend himself … so they overpowered him and stabbed him to death. And then, for some reason — “because we were sloshed and we wanted to find out how much fat the old seadog had in his body,” Neel told the court — the murderous sots dismembered the body. While the murder was not particularly premeditated, it occurred during a perceived crime wave, and the post-mortem butcher’s act really grossed out the court. (They probably also didn’t do themselves any favors at the bar by having attempted to sail to Newfoundland.) All in all, a prime case for example-setting: Neel, as the lead culprit in the caper, was sentenced to the worst example possible. His partner got 10 years at hard labor. Now, St. Pierre hadn’t had an execution and didn’t have the infrastructure for it. But French law didn’t let the locals in far-flung islands just do a practical straightforward thing like hang a bloke or shoot a bloke. And it wouldn’t do to have the colony send Neel somewhere where executions were a done thing. It was there in black and white that executions had to be conducted by guillotine, near the site of the crime. And so an old spare guillotine was disassembled, boxed up, and shipped up to St. Pierre from Martinique, expressly to sever Neel’s head. Neel seems to have been the calmest man on the island, almost philosophically indifferent to the the head-chopper. The community he had aggrieved could not say the same: St. Pierre had to recruit a local petty criminal to serve as executioner, and the guy was so ostracized that he left for France afterwards. They hadn’t thought through the execution procedure to determine who would give the order to drop the blade, so after an uncomfortable pause, Neel himself shouted at the executioner to do it. By the time it hit bottom, human flesh was left grotesquely clinging to the dull imported blade. The prosecutor vowed in the face of this dog’s breakfast never to seek another death sentence. Never used again, this infamous device remains in St. Pierre to this day. It can be seen there behind the stairs at the Musée de l’Arche. 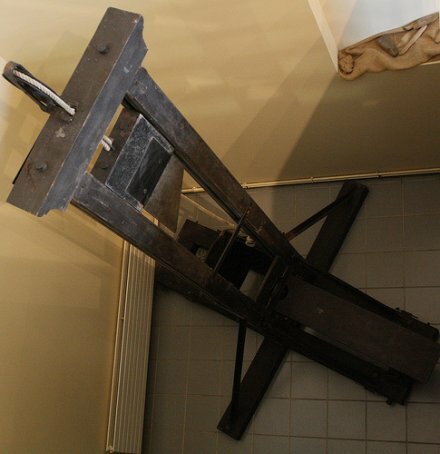 The St. Pierre guillotine. (cc) image from The Tedster, who also thoughtfully provides photos of the museum’s explanatory placards. 1, 2, 3, 4, 5, 6. The Neel story was “re-imagined” — nigh rewritten — for the heavily fictionalized 2000 Juliette Binoche film La Veuve de St. Pierre. The primary source for this account — apart from the museum placards linked in the caption above — is the invaluable Bois de Justice, an astonishingly encyclopedic resource on the history of the guillotine.